A better alternative to Payday Loans. LendUp offers online loans and credit cards with free financial education and the opportunity to build credit (where available). LendUp offers a quick online application and instant decisions, 24/7. Good credit isn’t required. LendUp also offer a series of free online education courses designed to boost financial savvy fast. By earning points, LendUp borrowers can move up the LendUp Ladder and gain access to apply for more money at lower rates over time. Completing actions such as on time loan repayment or taking free credit education courses are just a couple of the ways borrowers can earn points! LendUp is a direct lender, which means there’s no anonymous middleman involved, and they don’t sell personal information. Read the LendUp Payday Loans terms and conditions. Is LendUp Available In Your State? LendUp is available in the following states: Alabama, California, Florida, Hawaii, Idaho, Illinois, Indiana, Kansas, Louisiana, Maine, Minnesota, Mississippi, Missouri, New Mexico, Ohio, Oklahoma, Oregon, South Carolina, Tennessee, Texas, Utah, Washington, Wisconsin, Wyoming. LendUp has received 1.37 out of 5 stars based on 18 Customer Reviews and a BBB Rating of F.
LendUp is a direct lender that provides financial education and gamification for responsible lending behavior. LendUp loans to customers that banks usually decline, giving borrowers with poor credit scores access to short term loans without hidden fees, rollovers, and high interest rates. 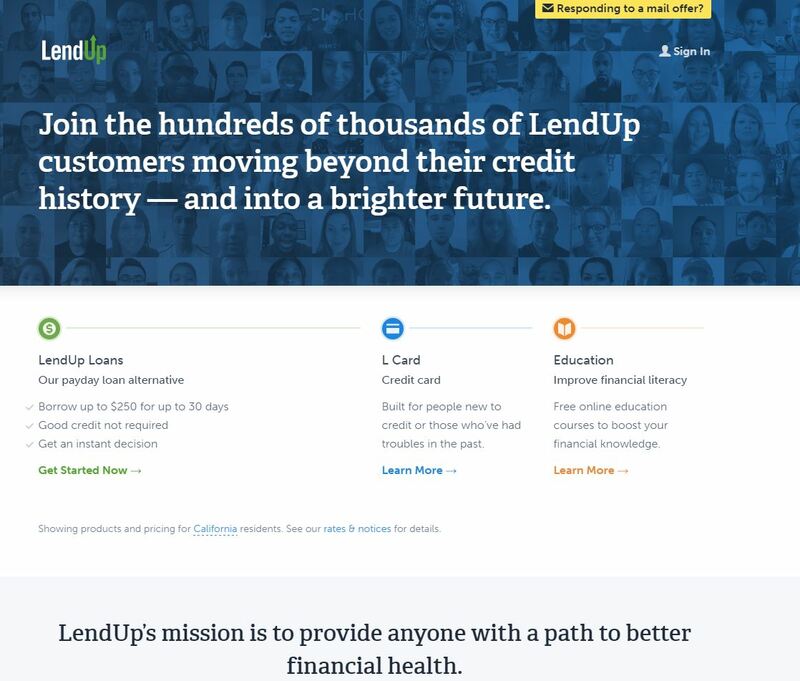 In September 2016 Lendup was fined by the Consumer Financial Protection Bureau and a California state regulator over widespread violations of payday- and installment-lending laws and agreed to pay over $6 million in penalties. The CFPB found that the company didn’t give consumers the opportunity to build credit or access to cheaper loans, as it had claimed it would. Over time, you can earn points to climb the LendUp Ladder to apply for larger loans at lower rates. Credit reporting to the major bureaus is offered at the top two levels (optionally at Platinum and automatically at Prime), which could eventually increase your credit score. Earning points is as simple as making on-time loan payments, taking our free financial education courses and referring friends who borrow from us. There are a variety of ways to earn points to climb the LendUp Ladder. While the simplest is to repay your loans on time, you can also earn points by taking our free education courses — a series of short, animated videos about credit, saving and more, all designed to boost your financial knowledge. And if you love LendUp, you can even earn points by submitting a testimonial video or referring friends who borrow from us.